The Florence Griswold Museum in Old Lyme, Connecticut is located in the Griswold House, a National Historic Landmark. In 1899, Miss Florence Griswold opened her family home to artists who formed the Lyme Art Colony. Around 1910, this was the center of Impressionist Art in the United States. Old Lyme, Connecticut, (population 8,000) started as part of Old Saybrook, founded in 1636. The towns separated in a “Loving Parting” in 1665. Old Lyme is bounded on the west by the Connecticut River and on the south by Long Island Sound. Agriculture was the main occupation of the first inhabitants, and town mills processed many agricultural products. Maritime industries, including shipbuilding and trade with the West Indies, thrived until about 1850. Many of the town's historic homes were built during this period. Old Lyme's population swells in summertime when its beaches, marinas, and cultural activities attract visitors. The town is also committed to preserving its natural resources, and dedicated the 588-acre Roger Tory Peterson Wildlife Area on Great Island in 2000. In 1899, Miss Florence Griswold opened her family home, Griswold House, to artists who formed the Lyme Art Colony. Old Lyme became known as the “American Giverny” and the home of American Impressionism. Artists such as Henry Ward Ranger, Childe Hassam, Willard Metcalf, and Wilson Irvine frequented the house and its grounds. The Florence Griswold Museum undertook an extensive restoration of the Griswold House, a National Historic Landmark, in 2006-07. The renovation included the stabilization of the exterior features, as well as upgrades to climate controls, electrical, lighting, and fire protection systems. Grants and foundations on the federal, state, and local levels contributed to the $2.5 million restoration project. The first floor of the Griswold House displays furnishings from 1910, when the house was the center of Impressionism in the United States. Paintings on the paneled walls and doors in the house, painted by artists who lived at the house, have been restored. The museum includes exhibition space on the second floor. Throughout the house, 489 paintings by more than 100 artists associated with the colony are on display. 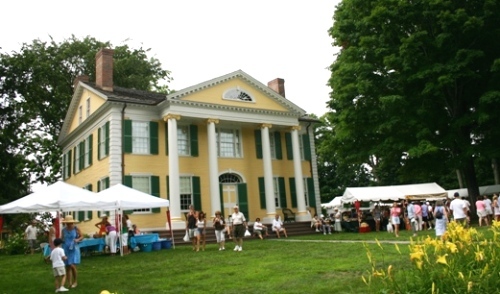 The Old Lyme Historic District is a National Register of Historic Places-designated historic district, established in 1971 and the oldest in the Connecticut Valley Shore. The district contains 80 structures, with 50 pre-dating 1900. The Midsummer Festival in Old Lyme has been an annual tradition for more than 20 years. The festival is sponsored by the Old Lyme Art Alliance and celebrates the town's artistic heritage. Concerts, art exhibits, art sales, fireworks, and art demonstrations are activities in the festival.